Rabbi Yitzhak Yosef visits the home of Rabbi Raziel Shevach. "He was immersed in Torah and kindness." 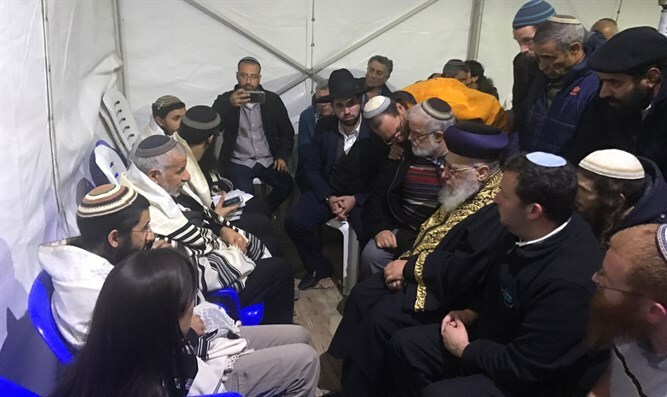 The Chief Sephardic Rabbi of Israel, Rabbi Yitzhak Yosef, on Sunday evening paid a condolence call at the home of Rabbi Raziel Shevach in Havat Gilad. Rabbi Shevach, a father of six children, was murdered in a shooting attack in Samaria last week. Rabbi Yosef said that Rabbi Shevach had received from him three different certificates of smicha (rabbinical ordination) and that it was clear that he was immersed in Torah and kindness and deserved all these documents. "The rabbinate of Rabbi Shevach was expressed in words between man and G-d and also in words between people. He also had humanity," said Rabbi Yosef.